A mobile crane overturned yesterday at a job site in the Jurong area of Singapore near the port and main industrial area of the city. 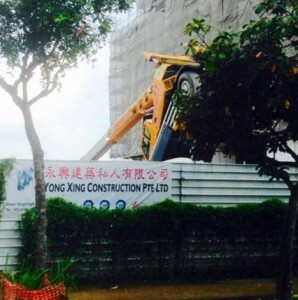 The incident caused work on the site – where contractor Yong Xing Construction is building a new electrical substation – to be suspended while the Ministry Of Manpower (MOM) carried out an investigation. The crane, rented from Beng Huat Crane, was apparently booming out at the time it overturned, we do not know if it had a load on the hook.